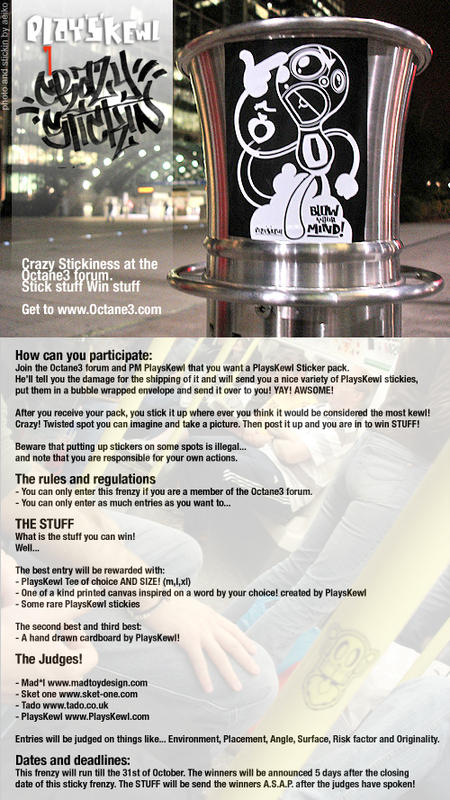 PlaysKewl is running a sweet sticker contest in the Octane3 Forum. You can read all the details above in the handy-dandy flier, but the key bits are that you need to join the Octane3 forum, PM him for a sticker pack, go nuts plastering 'em wherever you see fit (remember placing stickers in certain places can be illegal), take photos of your deeds, and post 'em in the forum. Prizes? Yup... PlaysKewl Tee, canvas, and rare stickers. Second and 3rd place score hand drawn cardboard originals. Deadline to enter: October 31st. No time to lose, get going! For the full dope, check out the flier loaded with info.